Why? Because we judge a book by its cover. We’re told not to but we can’t help it. Our brains are hardwired to notice patterns. Micro impressions change our perception, even if we don’t realize. If your content is good but doesn’t look the part, it may be overlooked. Fortunately, it’s very easy to change this; all it takes is a few minor tweaks. In this guide I’m going to show you a ridiculously simple process that almost guarantees your content will perform better, meaning more comments, shares, links, and traffic. The best part is that you can use this system to improve the content that you already have. All it takes is one tool and around 30 minutes of your time. Easy right? But like anything, it’s the subtleties that make all the difference. Let me explain. 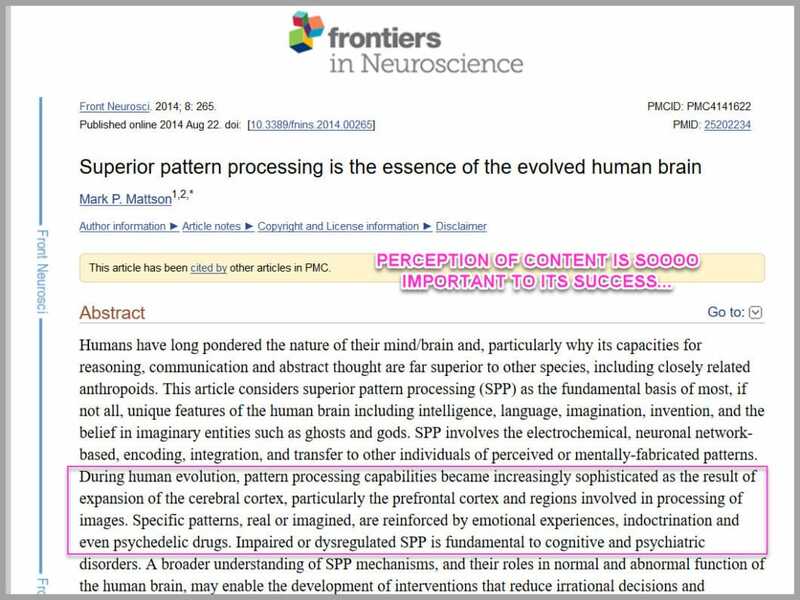 Our brains are designed to look for patterns. Pattern recognition is what kept us safe from predators and all that good stuff. The thing is, it works both for, and against us. We start to look for signals without meaning to. Markers that help us identify what something is, so we can save brain power. 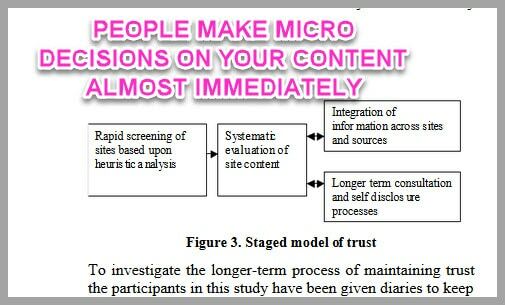 But this means if your content misses these markers, it can be ignored, or even worse, seem untrustworthy. 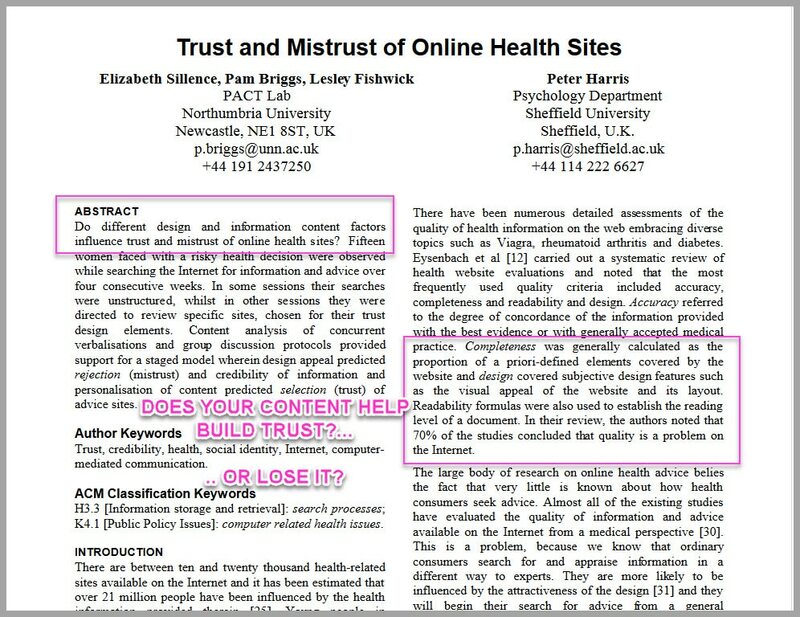 In a 2004 study by Sheffield University, they found that the visual perception of content, directly affected the trust or mistrust of a website. In one study they shared personal blogs vs government medical sites. The results were that people trusted the personal blog more, simply due to the design of the content. They even took it a step further and split test the results and shared the exact SAME content on two different sites. One had imagery and design, the other was all text. 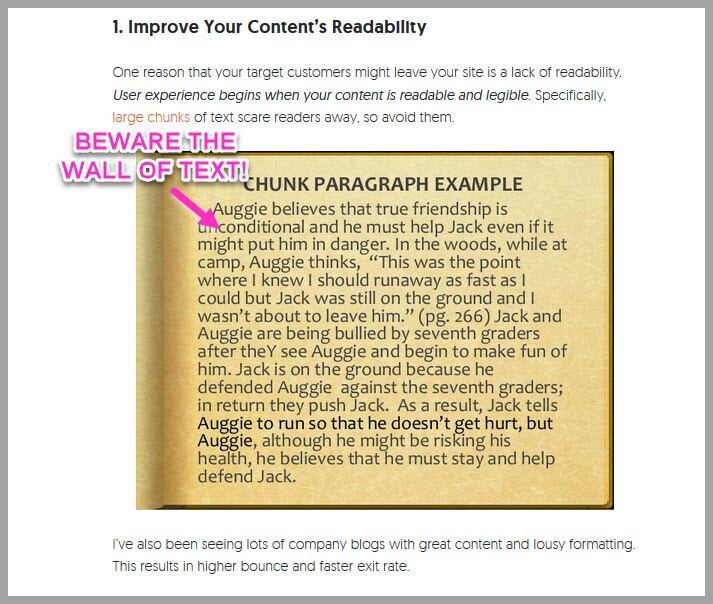 People trusted the site with images more…even though the written content was identical. Well, you spend all this time and effort, trying to get someone to read your content right? The last thing you want is for them to get overwhelmed and leave! It’s the exact same article, but with imagery added to make it easier on the eye. And because its easier to read? It means you lower bounce rate and gets them to start reading your content. You already know that adding images helps with perceived authority. If you’re writing a lot on the topic, then surely you must be an expert. It stops your reader saying ‘what if’ or having to go elsewhere because they can take action right there in your article. …and then sending them to your competitors because you didn’t show them how to take action. But by adding step-by-step imagery? They now feel empowered by your content. Not only do people see your content as more valuable, but they also take action on it. Why start with an old post? If you have an article that’s already getting traffic, its far more effective to improve that, then to write something brand new. 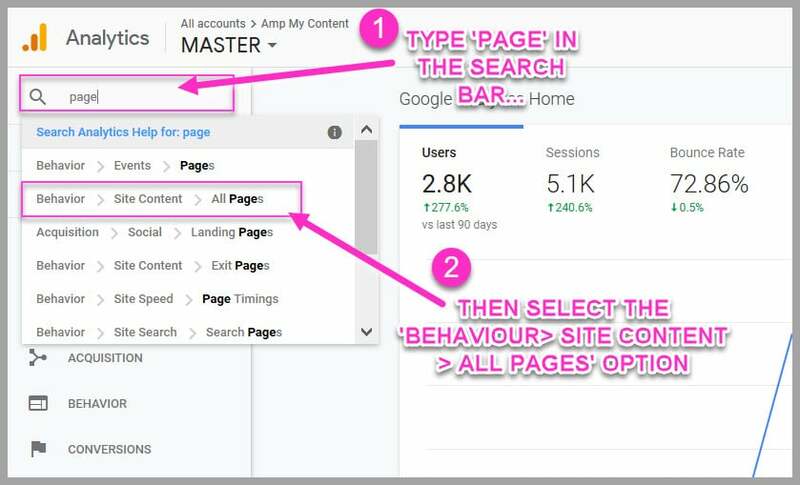 If you’re not sure which article to improve, then I recommend you do this: Head across to your Google Analytics Dashboard. You’re going to find your top performing articles, to help you choose which one to improve. A few options will appear in the drop down menu. Select the ‘Behavior > Site Content> All Pages’ option. This will load up the top performing pages on your website, based on traffic. Your goal is to choose a page that you want to improve. Leave the very top performing pages for now. I recommend picking a page that’s getting traffic, but isn’t the top performing. Once you decide which article to improve, make a note of the traffic that its currently getting (this way you can measure the improvement over time). Have you picked an article to work on? It’s almost time to start adding images, but before then? You need to to know what images to add where, and why to add them. You want them to stay and take action with you instead! You simply go through step by step so the reader doesn’t have to guess what to do next. You then repeat that process until you’ve walked them through each part. During your article, you probably referenced different resources right? Rather than just adding a link, go ahead and grab a screenshot. By adding an image it helps people connect it with the idea. It provides context so they can connect the dots. Sales online is all about building trust. The more you can build, the quicker you’ll make the sale. If you can boost it with some simple screenshots, then you’d be crazy not to add them right? Its super powerful and yet so simple to do. You saw this in the example before. This one is all about aesthetics and lowering bounce rate. Well, no one wants to read a wall of text right? Its hard on the eye, and it makes you think twice about reading your article. 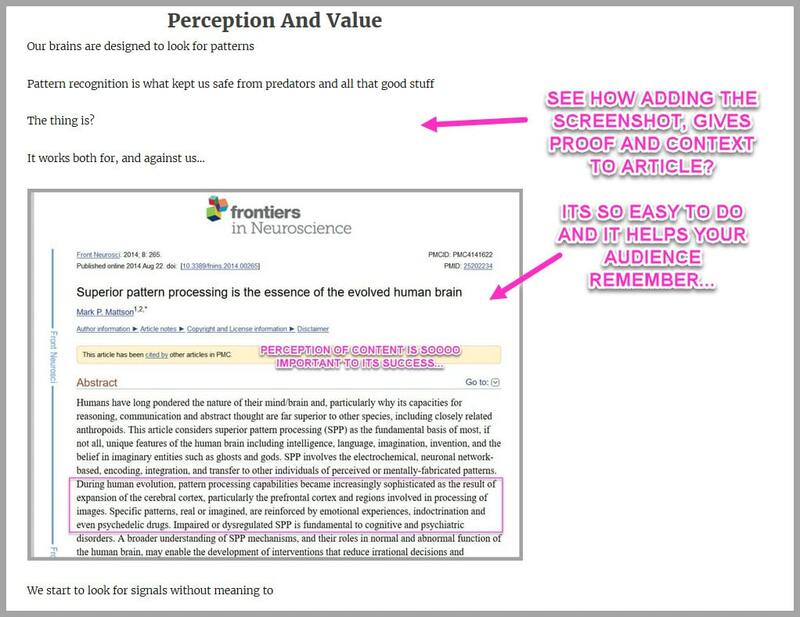 This method is so stupidly simple, but it makes your content far more effective. 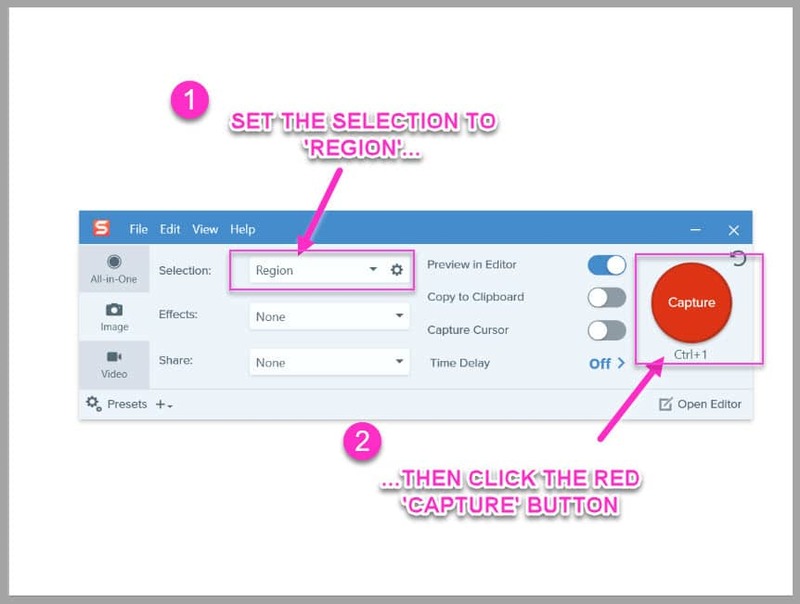 When you use Snagit to add them, it only takes seconds per image! 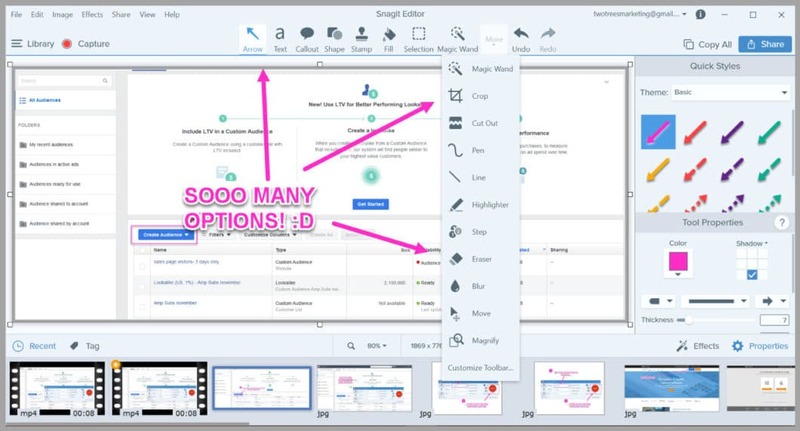 If you don’t have it already, you can grab a trial of Snagit. You’ll notice a few settings. 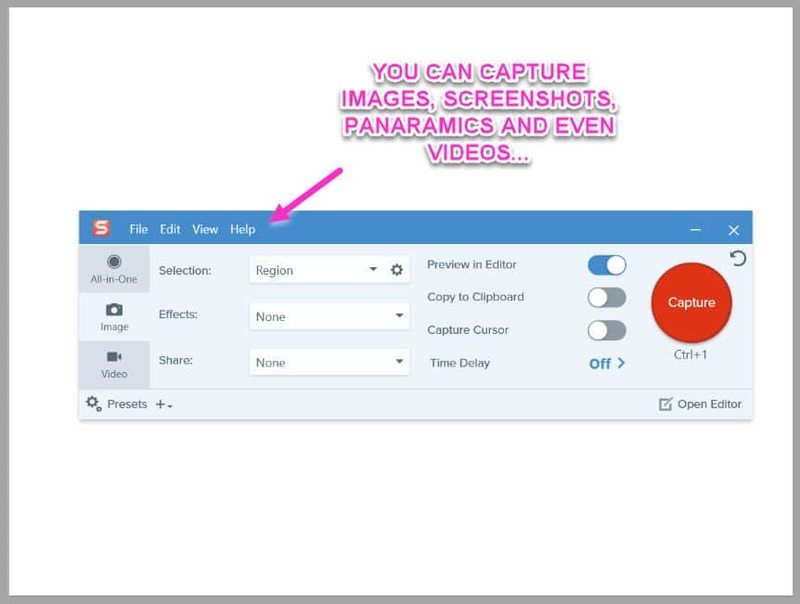 You can use it capture images, videos, gifs, and panoramic shots (Those large screenshots of a webpage etc). I used Snagit to capture and edit every image that you see in this article. Lets say that you wanted to add some step-by-step screenshots inside an article (like what I’m doing right now in this guide). In this example, I might be walking someone through how to set up a Facebook ad. Now that the page is loaded, you can capture the image. Make sure that you have the selection set to ‘region’, and then click the red ‘capture’ button. The interface will disappear and the view finder will load up. Snagit allows you to make edits to your image in seconds. You simply click which edit you want, and it happens. It helps to keep a visual aesthetic throughout the content. By always editing my images the same, it helps people remember my brand, and it makes the article look more professional. I recommend you do the same for your content, but using your own brand colors. I always start off by adding a border to my image. You simply click ‘Effects’ and then choose which Border you want to use. I like to use a thin grey border, because it helps the image pop on the page (just make sure you use the same border for each new image). The next step is to add a focal point to draw the readers attention. 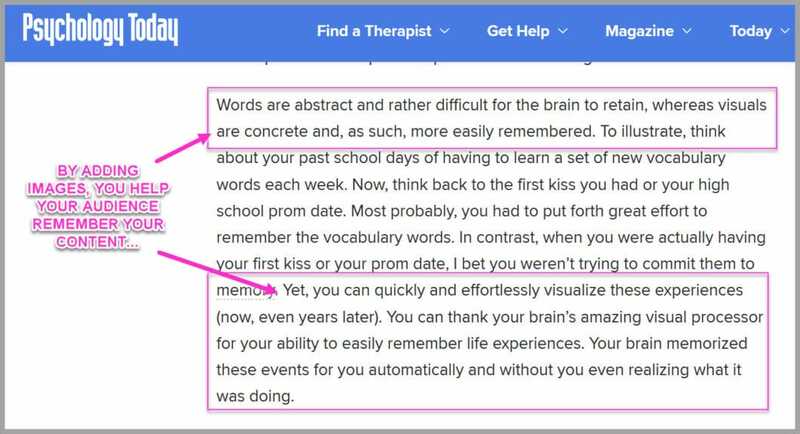 Maybe its a screenshot with a button they need to click, or a paragraph that supports your reference. See how the box and the arrow draws your attention to the button they need to press? Adding a focal point is real easy. Then pick one of the outline boxes and choose what color you want to use. Then simply drag and drop it like you did with the cross hairs before (I recommend you use the same color each time). So what if you want to use a specific colour, and you don’t know what it is? If the color you want to use is already in the screenshot, then simply click on the outline box in the right hand menu. Click on the color grabber tool, and then mouse over the colour you want to copy, and click it. Now the outline box will change color! Click on the outline tool again, and then click the little plus (+) sign below the colors. Now this custom color will be available for you to use for every future image! We know that adding the image helps them remember and connect with the idea. It doesn’t hurt to quickly support that by writing on the image, and it’s really simple to add. I like to always write in block capitals. By writing in caps, it helps them to read your note. So now the image is finished, you simply upload it into your article. Simply save the image and give it a name. Then find the location you want to add it, and upload it into your article. And there you have the image, looking awesome in your article (that whole process from start to finish, took us only 45 seconds to add that new image). 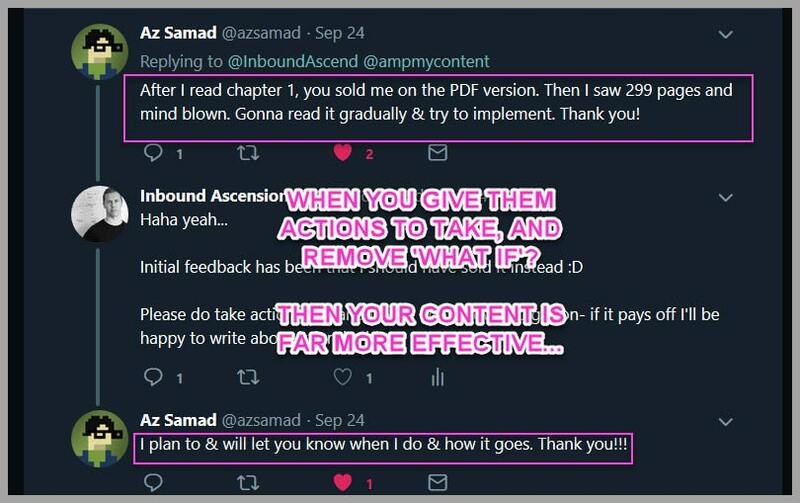 I hope you can see how easy this method is to improve your content. 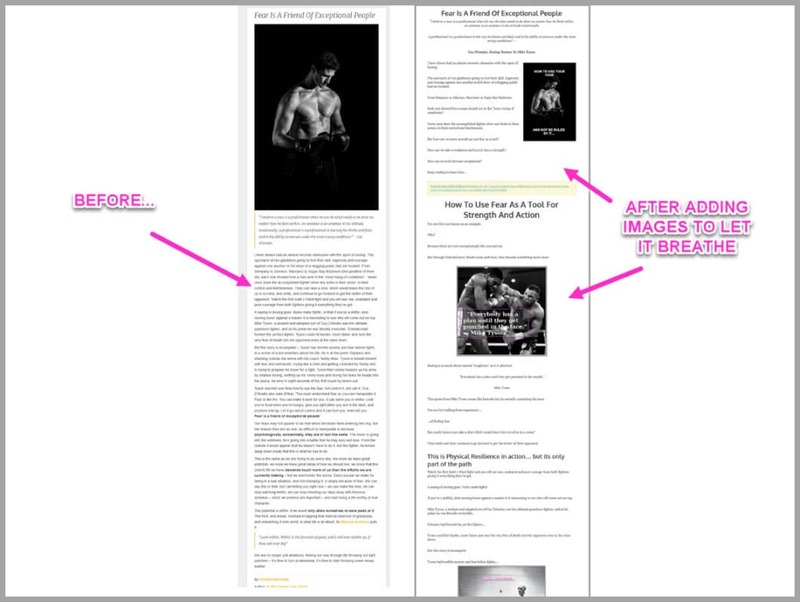 Sure it’s a little more effort, but its about 5 minutes longer for a MUCH better ROI from your content. Grab your Snagit trial here, and then go improve your content.